Thank you for entering our Two Castles Run and supporting Rotary funded charities and projects. We hope you enjoy the experience and will want to do it again. You will not be sent a hard copy of these joining instructions. Please print off a copy and bring it with you for reference if required for you and/or your supporters. Please ensure that all those who will be present at the Start or Finish are made aware of the relevant contents. Parking can be difficult at both places and there will be road closure notices on ALL roads along the route from Warwick Castle to Kenilworth Castle but these roads will be opened once the runners have passed through and it is safe to do so. Ample time should be allowed for drop off, parking and getting to the start, finish or vantage point. 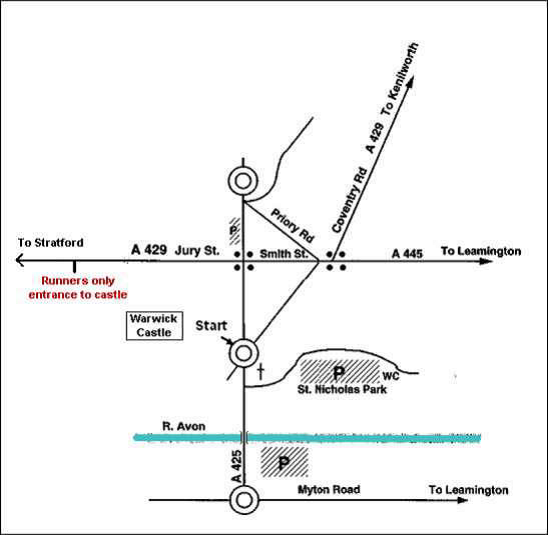 It is suggested you aim to arrive within the grounds of Warwick Castle via the Stratford Road entrance ONLY by 8.15am. Ensure appropriate clothing is worn to allow for adverse weather conditions. STOPPING WILL NOT BE ALLOWED IN BANBURY ROAD AND ENTRY TO WARWICK CASTLE IS ONLY AT THE STRATFORD ROAD ENTRANCE. Access will not be possible via the front entrance, opposite St Nicholas Church, nor the Stables car park in Castle Lane, as they will be shut. Please follow the signs to the Start. For map please see below. Allow at least 5 minutes to jog from Stratford Road car park and 20 minutes from any other parking. Please note the gate from the car park into Warwick Castle will be closed at 8.45 am. No entry can be allowed after this time. Without your race number you will not be allowed into the Warwick Castle grounds. If you have found a substitute he/she MUST have your number and chip to gain entry into Warwick Castle. the only access for pedestrians and supporters, using the complimentary tickets to Kenilworth Castle, is via the Silver Gate opposite Castle Green and the Queen and Castle public house, and only until 10.00 am. There will be no spectator access to Kenilworth Castle via the Brays Car Park entrance. The Race Director, Race Referee & the Emergency services reserve the right to stop the Run at any time if deemed necessary. This would be in circumstances beyond our control and no refunds can be made. Runners are responsible for their own health and safety. Participation is at your own risk. Please take care before during and after the run. Please ensure you arrive in ample time. Warwick is likely to be congested with many runners being dropped off. If you are parking then, depending on where you park, it could take you up to an hour to walk to the castle entrance and check in any kit you want transported to the finish. It is suggested that you should be inside the grounds at the Stratford Road entrance of Warwick Castle by 8.15am at the very latest. Dress appropriately for the event and display your allocated number on your vest front (having completed the emergency data required on its reverse).. Please only run if you are fit enough. Even a cold or flu can cause real problems. Ensure that you have taken enough liquids. There are 3 water stations on the course at Leek Wootton, Rouncil Lane and Roundshill and one at the finish. Dehydration can cause major problems. Please beware of any traffic – there may be some even though all the roads will be subject to a road closure notice. Please keep to the left as much as you can and on the footpath or cycle-path where possible. 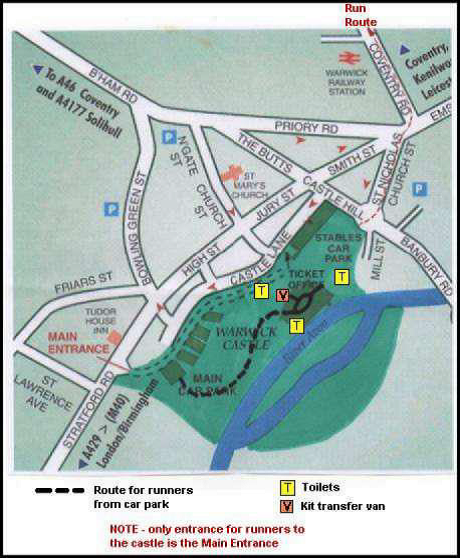 Please note that the only runner access to the start line in Warwick Castle is through the Stratford Road car park of the Castle. The front gates of the Castle, Castle Lane and the Stables car park are all closed. There are no other entrances to the Start. No spectators will be able to enter the grounds of Warwick Castle. Drop-off is best in Stratford Road or in the Warwick Castle car park which is accessed from Stratford Road and which is free until 9.45am from which time usual charges will apply. No stopping will be allowed in Banbury Road so that traffic will be kept moving near the Castle. The Warwickshire Golf & Country Club will again provide staff to help you with the warm-up in the central court yard from where runners will be called down to the start. Please ensure that the disposable electronic timing chip is adequately fastened to your shoelace, if not your time cannot be recorded. Please dispose of the electronic chip in the bins provided outside the finish compound. Bags with labels will be available to transport tracksuits, etc. to the finish. Please put your Run number on the label provided and stick it firmly to the plastic bag also provided. The vans will be located in Warwick Castle and well-marked. At the finish, the location of the kit will be marked. We regret that we are unable to transport cycles to Kenilworth Castle. You should leave these in the car park securely locked. Free Bus transport is available from Kenilworth Castle back to the island by the front entrance to Warwick Castle. Locations of toilets will be signposted. Please allow serious runners to line up at the front. Please comply with the signs that indicate your estimated finish time. Please be aware that there may be road works in and around Warwick which will delay you getting to the start. Warwick Castle’s Stratford Road car park can be used for dropping off and limited parking is available but usual charges (£6 at time of writing) apply after 9.45am. The Butts (opposite King’s High School for Girls - see map). Cut-Off times: We are required by the Police to clear roads after set times. You will be out of time and regarded as a normal pedestrian if you have not reached the Anchor Public House in Leek Wootton by 10.15am, Roundshill by 10.40am and the Finish by 11.15am. This is equivalent to just over 3mph, walking pace. Marshals & Signage will be progressively removed. Slow participants are encouraged to use the pavement and the courtesy vehicle at the back of the Run, if necessary. Please be aware that there are safety issues if you continue because of the lack of marshals so PLEASE take care if you personally decide to continue and bear in mind that some if not all marshals may have left their post. There is no parking at The Brays or Castle Green Car Parks beside Kenilworth Castle on race day. Off Forrest Road (follow signs) –temporary parking until 12 noon only and may not be available if ground is very wet. Free parking but donations would be appreciated in the available receptacles. This area MAY NOT be available if very wet. If spectators using any of these car parks they should allow at least 20 minutes if they intend to be at the finish inside Kenilworth Castle. Entry with the complimentary ticket is up to 10am only after which a charge will be made by Kenilworth Castle. Please note – roads closures will be in place on the approaches to Kenilworth Castle from 8.50 – 11.30 am approx. so spectators should allow ample time to park and get to the finish. There is no free ticket access to Kenilworth Castle after 10.00 am. Spectators: There is no spectator entrance to the Castle from the Brays Car park and the Tiltyard. Spectator entrance to the Castle is through the SILVER GATE ONLY opposite Castle Green (by the Queen and Castle Public House) AND before 10.00am (after which entry charges will apply). Please ask your supporters to allow sufficient time to get into the Castle or at a vantage point in the streets leading to the Castle. The Tiltyard will be closed to spectators. Exit is through the double wooden gates opposite the Queen & Castle. Race Numbers/electronic timing chips: The chip timing device is disposable so please discard in the bins provided at the finish. Please keep your Race Number on your vest until you have collected your T shirt and medal. No number = no prize/medal/T Shirt No chip = no time. Free Transport back to Warwick and will drop you at the Start Point (not Stratford Road Car Park) at Warwick Castle to allow more time for coaches to return to Kenilworth. For a sponsorship form, please see http://www.twocastlesrun.org.uk/ and follow the “sponsorship form” link. If your sponsor is a taxpayer, Rotary can only recover the tax paid on their donation if, on the Sponsorship Form, the donors name is legible and is accompanied by their signature, address and ticked Gift Aid box. The Sponsorship Form must be sent together with the cheque if Rotary is to recover the tax on the donations. (cheques payable to Rotary Club of Kenilworth) by 31 July 2015 please. Results: Are available from FRSystems at www.frsystems.co.uk. These should be available within a short time after the race is completed.. Feedback is always welcome. We like to tell those who help us, and without whom there would be no Two Castles Run, the nice things that you say about them. We also want to improve the experience for next year. Constructive criticism is always welcome so we can improve the race for both runners and spectators. Thank you for your support, enjoy yourself and good luck. On behalf of the 2CR organising committee. The Rotary Club of Kenilworth is supported by many organisations in making this event a success and we sincerely thank them all.